Facebook is enabling its users to test apps without sharing any of their personal information from the social network, thanks to a new Anonymous Login feature. 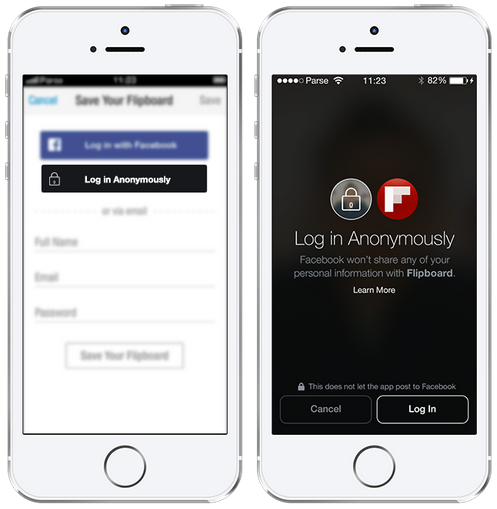 With Anonymous Login, Facebook users have more control over the information that is shared with apps. The feature allows users to log in to apps with their Facebook credentials, but without sharing any personal information from Facebook. This allows users to test out apps and decide if they want to share more information after they learn more about the app. It will be interesting to see how this feature unfolds, as people will likely be more willing to try apps if their personal data isn’t being shared. Currently, the Anonymous Login feature is being tested with just a few developers. That said, Facebook says it plans to open the feature up to more developers in the coming months. In the meantime, developers can apply for access to the feature here.